Decks are significant components of outdoor living. Homeowners usually add on a deck for various reasons, but the majority of them consider the idea purely to add on more living and entertainment space to their home. Decks can be used for all sorts of outdoor entertainment events like a barbeque or a party and even for meals with visitors. Regardless of the reason, one thing is for sure that the decks are a great spot to grab some hot drinks on cool nights and cold refreshments when the weather is hot. There is a wide variety of deck services available in the market to make the home even more spacious and attractive as well. Being one of the most popular choices among all decking materials, green treated lumber has the capacity to withstand even the harshest of the weather conditions. No extra treatment will be necessary if you decide to seal in the beauty of natural wood into your home space. Not only they are sturdy enough to last a lifetime but also, they provide some of the most elegant looks that you can ever find. A lot of hardwoods can be green treated and are finally left unpainted except just a light staining on them. Choosing natural cedar as one of your primary deck services provides a beautiful rosy hue to your deck. In addition, it gives your deck a natural, rough-hewn look. Although the wider planks turn out to be more expensive than the treated lumber, the aesthetic beauty of the finished product makes up for the higher cost. While constructing your deck with cedar wood, make sure you get your wood treated, sealed and painted to get the desired decoration scheme. Proper maintenance is required in order to store in the goodness of the wood and its beauty. Made up of recycled materials including wood and plastic, composite decking is one of the most nature-friendly choices of decking materials. All the recycled materials are processed and then pressed into composite planks which are then used for building or repairing your deck. They are much more affordable when compared to other materials and are extremely environment-friendly too. With proper care and maintenance, they can be protected from the regular wear and tear and last longer. PVC coated composite is one of the newest and most popular items among the constructors when it comes to building decks. 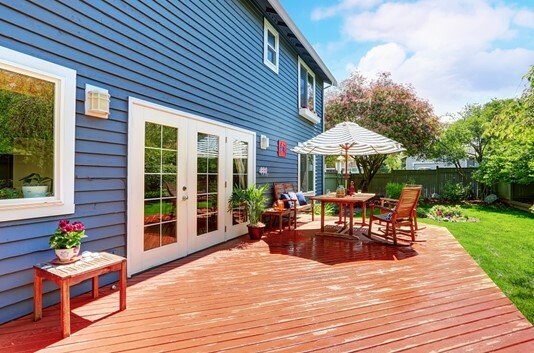 This type of decking is quite similar to that of composite decking. They comprise of rescued wood and plastic grounded to form planks. Now, in this case, the composite deck is covered and protected by a poly cover. Some of the manufacturers provide coverings on the side along with top whereas some cover the top only. Such coverings provide protection against staining, scratching and fading. They also protect the recycled wood to come in contact with moisture or it may develop mold over time. This type of decking is made from PVC and is made to be exceptionally stain resistant as well as fade resistant to the use of UV blockers. Many customers confuse PVC decking with white vinyl, but that is not the case. PVC decking comes in some of the most attractive and earthly designs to give your deck a natural look and feel. Many are backed by a lifetime warranty and some also come with matching railing systems. Just with a bit of regular maintenance they can look new forever. So, those were the five most commonly used materials availing for deck services. You can choose as per your budget and other preferences.